In this tutorial, we are going to shed some light on one of the most mysterious inhabitants of the Excel universe - the OFFSET function. So, what is OFFSET in Excel? In a nutshell, the OFFSET formula returns a reference to a range that is offset from a starting cell or a range of cells by a specified number of rows and columns. The Excel OFFSET function may be a bit tricky to get, so let's go over a short technical explanation first (I'll do my best to keep it simple) and then we will cover a few of the most efficient ways to use OFFSET in Excel. The OFFSET function in Excel returns a cell or range of cells that is a given number of rows and columns from a given cell or range. The first 3 arguments are required and the last 2 are optional. All of the arguments can be references to other cells or results returned by other Excel formulas. It looks like Microsoft made a good effort to put some meaning into the parameters' names, and they do give a hint at what you are supposed to specify in each. Reference - a cell or a range of adjacent cells from which you base the offset. You can think of it as the starting point. Rows - The number of rows to move from the starting point, up or down. If rows is a positive number, the formula moves below the starting reference, in case of a negative number it goes above the starting reference. Cols - The number of columns you want the formula to move from the starting point. As well as rows, cols can be positive (to the right of the starting reference) or negative (to the left of the starting reference). Height - the height, in number of rows, of the returned reference. Width - the width, in number of columns, of the returned reference. Both the height and width arguments must always be positive numbers. If either is omitted, the height or width of the starting reference is used. And now, let's illustrate the theory with an example of the simplest OFFSET formula. The formula tells Excel to take cell A1 as the starting point (reference), then move 3 rows down (rows argument) and 1 column to the left (cols argument). As the result, this OFFSET formula returns the value in cell B4. 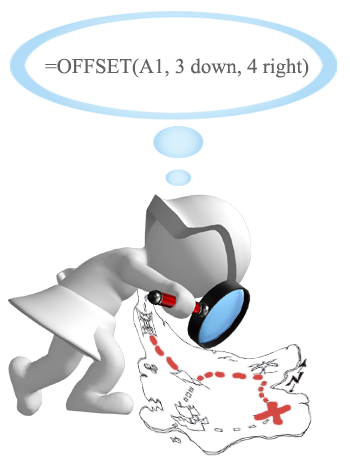 The image on the left shows the function's route and the screenshot on the right demonstrates how you can use the OFFSET formula on real-life data. The only difference between the two formulas is that the second one (on the right) includes a cell reference (E1) in the rows argument. But since cell E1 contains number 3, and exactly the same number appears in the rows argument of the first formula, both would return an identical result - the value in B4. The OFFSET function is Excel doesn't actually move any cells or ranges, it just returns a reference. When an OFFSET formula returns a range of cells, the rows and cols arguments always refer to the upper-left cell in the returned rage. The reference argument must include a cell or range of adjacent cells, otherwise your formula will return the #VALUE! error. If the specified rows and/or cols move a reference over the edge of the spreadsheet, your Excel OFFSET formula will return the #REF! error. 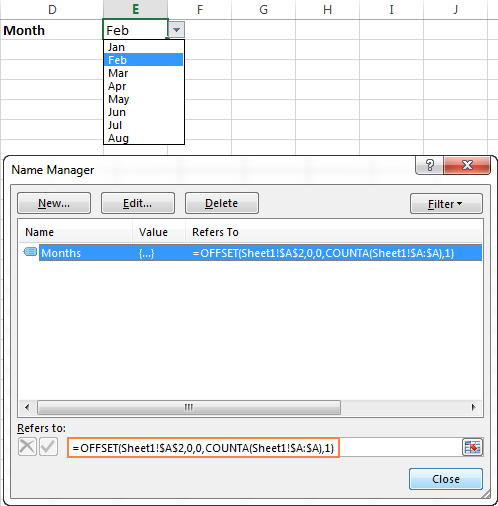 The OFFSET function can be used within any other Excel function that accepts a cell / range reference in its arguments. The formula will return the sum of values in a 1-row by 3-column range that is 3 rows below and 1 column to the right of cell A1, i.e. the total of values in cells B4:D4. Why do I use OFFSET in Excel? Now that you know what the Excel OFFSET function does, you may be asking yourself "Why bother using it?" Why not simply write a direct reference like B4:D4? Creating dynamic ranges: References like B1:C4 are static, meaning they always refer to a given range. But some tasks are easier to perform with dynamic ranges. This is particularly the case when you work with changing data, e.g. you have a worksheet where a new row or column is added every week. Getting the range from the starting cell. Sometimes, you may not know the actual address of the range, though you do know it starts from a certain cell. In such scenarios, using OFFSET in Excel is the right way to go. I hope you haven't get bored with that much of theory. Anyway, now we are getting to the most exciting part - practical uses of the OFFSET function. The example we discussed a moment ago demonstrates the simplest usage of OFFSET & SUM in Excel. Now, let's look at these functions at another angle and see what else they can do. When working with continuously updated worksheets, you may want to have a SUM formula that automatically picks all newly added rows. Suppose, you have the source data similar to what you see in the screenshot below. Every month a new row is added just above the SUM formula, and naturally, you want to have it included in the total. 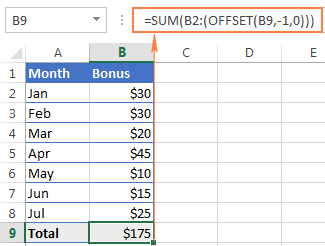 On the whole, there are two choices - either update the range in the SUM formula each time manually or have the Excel OFFSET formula do this for you. Reference - the cell containing the total, B9 in our case. Rows - the cell right above the total, which requires the negative number -1. Cols - it's 0 because you don't want to change the column. In the above example, suppose you want to know the amount of bonuses for the last N months rather than grand total. You also want the formula to automatically include any new rows you add to the sheet. Reference - the header of the column whose values you want to sum, cell B1 in this example. Rows - to calculate the number of rows to offset, you use either the COUNT or COUNTA function. COUNT returns the number of cells in column B that contain numbers, from which you subtract the last N months (the number is cell E1), and add 1. If COUNTA is your function of choice, you don't need to add 1, since this function counts all non-empty cells, and a header row with a text value adds an extra cell that our formula needs. Please note that this formula will work correctly only on a similar table structure - one header row followed by rows with numbers. For different table layouts, you may need to make some adjustments in the OFFSET/COUNTA formula. Cols - the number of columns to offset is zero (0). Height - the number of rows to sum is specified in E1. The key benefit of these formulas over the usual AVERAGE(B5:B8) or MAX(B5:B8) is that you won't have to update the formula every time your source table gets updated. No matter how many new rows are added or deleted in your Excel worksheet, the OFFSET formulas will always refer to the specified number of last (lower-most) cells in the column. Used in conjunction with COUNTA, the OFFSET function can help you make a dynamic range that may prove useful in many scenarios, for example to create automatically updatable drop-down lists. At the heart of this formula, you use the COUNTA function to get the number of non-blank cells in the target column. That number goes to the height argument of OFFSET instructing it how many rows to return. Reference is the starting point from which you base the offset, for example Sheet1!$A$1. Rows and Cols are both 0 because there are no columns or rows to offset. Note. If you are making a dynamic range in the current sheet, there is no need to include the sheet name in the references, Excel will do it for you automatically when creating the named range. Otherwise, be sure to include the sheet's name followed by the exclamation point like in this formula example. Once you've created a dynamic named range with the above OFFSET formula, you can use Excel Data Validation to make a dynamic dropdown list that will update automatically as soon as you add or remove items from the source list. As everyone knows, simple vertical and horizontal lookups in Excel are performed with the VLOOKUP or HLOOKUP function, respectively. However, these functions have too many limitations and often stumble in more powerful and complex lookup formulas. So, in order to perform more sophisticated lookups in your Excel tables, you have to look for alternatives such as INDEX, MATCH and OFFSET. One of the most infamous limitations of the Excel VLOOKUP function is inability to look at its left, meaning that VLOOKUP can only return a value to the right of the lookup column. 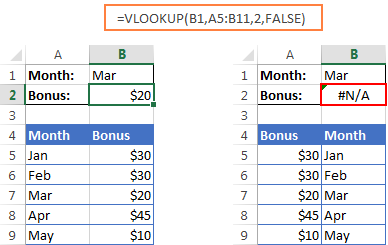 As is the case with Excel VLOOKUP being unable to look at the left, its horizontal counterpart - HLOOKUP function - cannot look upwards to return a value. It's not the easiest thing to remember, is it? In addition, this is an array formula, so don't forget to press Ctrl + Shift + Enter to enter it correctly. Of course, this lengthy OFFSET formula is not the only possible way to do a double lookup in Excel. You can get the same result by using the VLOOKUP & MATCH functions, SUMPRODUCT, or INDEX & MATCH. There is even a formula-free way - to employ named ranges and the intersection operator (space). The following tutorial explains all alternative solutions in full detail: How to do two-way lookup in Excel. Hopefully, the formula examples on this page have shed some light on how to use OFFSET in Excel. However, to efficiently leverage the function in your own workbooks, you should not only be knowledgeable of its strengths, but also be wary of its weaknesses. 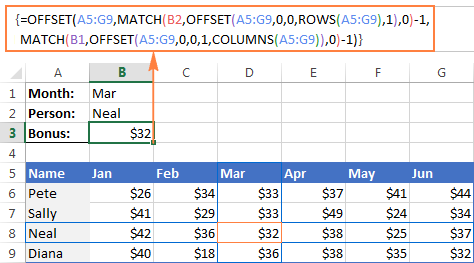 Excel OFFSET is a resource-hungry function. Whenever there is any change in the source data, your OFFSET formulas are recalculated, keeping Excel busy for a little longer. This is not an issue for a single formula in a small spreadsheet. But if there are dozens or hundreds of formulas in a workbook, Microsoft Excel may take quite a while to recalculate. Excel OFFSET formulas are hard to review. Because references returned by the Excel OFFSET function are dynamic, big formulas (especially with nested OFFSETs) can be quite tricky to debug. As is often the case in Excel, the same result can be achieved in a number of different ways. So, here are three elegant alternatives to Excel OFFSET. Since Excel 2002, we have a truly wonderful feature - fully-fledged Excel tables, as opposed to usual ranges. To make a table from structured data, you simply click Insert > Table on the Home tab or press Ctrl + T.
By entering a formula in one cell in an Excel table, you can create a so-called "calculated column" that automatically copies the formula to all other cells in that column and adjusts the formula for each row in the table. Moreover, any formula that refers to a table's data automatically adjusts to include any new rows you add to the table or exclude the rows you delete. Technically, such formulas operate on table columns or rows, which are dynamic ranges in nature. Each table in a workbook has a unique name (the default ones are Table1, Table2, etc.) and you are free to rename your table via the Design tab > Properties group > Table Name text box. 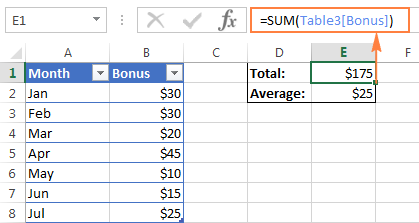 The following screenshot demonstrates the SUM formula that refers to the Bonus column of Table3. Please pay attention that the formula includes the table's column name rather than a range of cells. Although not exactly in the same way as OFFSET, Excel INDEX can also be used to create dynamic range references. Unlike OFFSET, the INDEX function is not volatile, so it won't slow down your Excel. Using the INDIRECT function you can create dynamic range references from many sources such as cell values, cell values and text, named ranges. It can also dynamically refer to another Excel sheet or workbook. You can find all these formula examples in our Excel INDIRECT function tutorial. Do you remember the question asked at the beginning of this tutorial - What is OFFSET in Excel? I hope now you know the answer : ) If you want some more hands-on experience, feel free to download the workbook containing all of the OFFSET formulas on this page and reverse engineer them for deeper understanding. Thank you for reading! 53 Responses to "Using OFFSET function in Excel - formula examples"
Hey, I just wanted to say that I really appreciate you putting this together. I'm sure it involved quite a bit of work! Hi!, I want to thank Oyu in advance. I use this function to count the number of zeros after the last non zero data. It works perfect, except when the first cell in the row is zero. I want the formula to start counting zeros from the first cell if it is zero. For us to be able to assist you better, please send us a sample table with your data in Excel to support@ablebits.com. I have to 2 excel sheet. Sheet A :The value for average of differnt columns in different cells but in same row G41. (average of column c in c41;average of column G in G41;average of column J in J41 and so on )set repeats after every 6 columns. Thanks for this email. I need your help. I want a formula to search for certain strings located in a column in one sheet from a column in another sheet and replace the content of the column in the second sheet with that of the string from the first sheet if found. i.e. if 'xyz' in cell A1 of sheet test if found in 'sjkhgjjhkxyzrewqed' of cell b3 in sheet test2 replace 'sjkhgjjhkxyzrewqed' with 'xyz'. Thanks to your expected help. This post is very insightful indeed. I have learned a lot. Many thanks! I have an excel data that I use to monitor attendance at meetings. The columns labelled YES/NO tell whether the meeting was held or not. I want to monitor attendance in the last N meetings held (eg.last 2 or 3 columns with a "YES"). It should not count the cell when the column heading is "NO". Sorry, it's difficult to create a formula according to your example. Could you sand us a small sample table in Excel to support@ablebits.com? the above would all be in 1 cell, but with 1 word per line and a new line character after each word (by pressing alt+enter). This works great, but if I use the offset function and it selects that cell, I get "thisismydata" with no newline characters in it. Thank you for your help. I can now view well the function of Offset as compared to Index and Vlookup. I have a variable value in C6 which should be matched with the value in E6. C6 depends on the value in A2 not directly but indirectly. I want the excel to auto calculate A2, for any given value in E6, such that C6=E6. A BIG thanks for this clarification. However, I need your help in the following issue: OFFSET function returns the value of a specific cell. How can I get the value next to that cell, and the one next to it, and the one next to it, etc. In other words, I need your help in the following: As I go to the right, I want to get the values of certain cells that go downwards. Hope that is clear. I really appreciate your help. Great summary on Offset, just one question that can I use offset in two different excel workbook? Hopefully I am in the right spot for this question..
Basically I want to count the number of times a certain number appears in the last 20 results in a list - the list is updated often, so last 20 results changes. Appreciate any assistance you can give. Excellent examples and discussions on OFFSET. How can you ensure that the cell format is the same when using OFFSET. For e.g., the OFFSET works, it returns the value of the cell to the appropriate new location, but some of my original cells are text hyperlinks (URLs). Thus, OFFSET only returns the text and it is not hyperlinked. Is this achievable? i am facing an issue in excel how can i merge these two colums in one cell in top to down maner. I found Tutorials on Using OFFSET function in Excel-formula examples, very useful and helped me to understand the offset function better. Excellent detailed examples on offset. I am not 100% sure if this uses the offset ruling or just the countif but i would really (really really really !!!) appreciate the advice. My data set involves dates and times and I want to make a count of new events occurring in a separate column. A new event is classed as anytime the previous column has increased by 5 minutes. so the data is times and dates of pictures taken of animals and i have to make a count of every time an event happens. An event is classified as any new animal that comes into view or if the same animal goes off camera and returns with over a 5 minute increase from the last time it was shown on camera. So if it goes off camera and comes back under 5 minutes time(for example 4mins 31) i dont want to count it. Further more, if another animal comes into view so 2 are in the shot i want to classify that as a new event also. so as you can see it is the end column i need the formula for to take into account date and time increase by 5 minute increases and an added count for if there is an extra animal in shot. I have 15,000+ data points so if you can help me it would just be amazing. The times only show shots of animals so theres no need to worry about an animal column. hello there, I am trying to find the average of completion of TASKS CATEGORY based on the completion of individual TASKS. I have 22 tasks in each table and a total of 3 main tasks category, and I am not able to return to average based on the product name. c4 to c25 is the percentage value of progress for each task. The table repeats itself underneath several times, what changes is the product name on b1, b27, b53, b79.. The tasks name (p1 to p22) are identical for each table in column b. I think the problem I am having is to return the average of the categories: tasks named p1 to p7 (cells b4 to b10) belong to the first category, tasks named p8 to p15 (cells b11 to b18) belong to the same category, and tasks named p16 to p22 (cells b19 to b25) belong to the third category. How do I get the average of the categories based on individual tasks completion % in column c based on the unique product name which is in b1, b27, b53, b79.. Thank you so much!! Could you explain please how to use SUMIFS and Offset together in one formula. Thank you in advance. Excellent tutorials on Use of OFFSET Function. I have a spreadsheet with months 1,2,3 etc across the rows and a specific number of months to count backwards in a cell. For instance, I want to use the offset function to count back 6 columns from the reference cell. However, the 6 month count results in being either off the spreadsheet or into my column with all my field labels. This is causing the error either #value or #ref.. Unless I put the offset formula starting after column F (6 columns forward). How can I incorporate the offset function while not going off the sheet or into a cell that has text? Hey Greg, I'm having the same problem. Did you ever figure it out? I am trying to create a sheet where the data is referenced from another sheet "Data_Sheet_name" and then creating multiple such coupled sheets using VBA. But every time I create a copy of the data sheet the referencing go haywire. So I want a formula which can dynamically be linked to the sheet based on the active sheet name. Hi! This is an awesome forum and thank you for teaching me the offset function. It is working almost perfectly for me but I need to understand how to return the last 5 values in a single column of data and ignore the zeros... so my data looks like this - my offset calc is bringing back the last 5 values - but is bringing back 18, 16, 0, 17, 24 and I need to bring back 18, 16, 17, 24, 22... recommendations? Thank you so much! I have a spreadsheet with headings in column A. I would like to use a formula to to create a contiguous information - that is no unnecessary blank rows but I do need to keep all the headings in the rows. I need a excel formula that will arrange values in a row from differents columns but avoid 0(zero)value if in any cell. Just to say thanks for your Excel tips they are the best currently on the internet. I am currently using OFFSET and it is working very well. Can anybody see the glaringly obvious that I am missing? It works fine if I use a similar construct as a SUM(). Or is there an unpublished limitation in the function? Anyone up for a super big challenge? Here is my formula: I need it OFFSET! New York to LA 1300 miles !!! !!! !! So go to the New York to LA...You see it's 1300 Miles? Note going horizontally is New York, Chicago, and DC. I need to fill those in. So I need to copy that massive formula ACROSS, but I need the rows to go DOWN. Columns stay the same, rows go down using OFfset. I have played with your simple example of the SUM & OFFSET (where the result is displayed in cell G2), setting the above mentioned arguments to negative values. Excel accepted the negative values of the HEIGHT and WIDTH arguments, without any problem…. So, Microsoft's user's manual is probably wrong…. I use OFFSET and Define Name to dynamically track the most recent 5 test results on a spreadsheet that expands over time. The problem I run into is when entering the first few results. Any time there are less columns (or rows) with data than you have indicated in your OFFSET formula, the formula will reference irrelevant cells or produce errors if it runs out of columns (or rows). 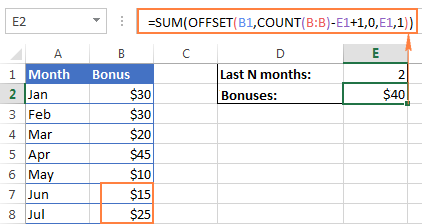 For example, if my OFFSET is set to -5 (columns), but I only have 2 or 3 columns of data, my Offset formula will still try to reference 5 columns… so it will end up referencing column titles or whatever is to the left of my starting reference, or it will produce an error because there are no more columns remaining on the spreadsheet. Is there a way to avoid this? Maybe some kind of parameter that tells it to stop at a specified column, or mixing in an IF, THEN formula? I have around 10000 in one column , i would like do do shift every 100 rows then write the value and do on . I have around 10000 values in one column , i would like to do shift every 100 rows then write the value and do on . Hi, how do I copy even cells in one column and odd cell in another column. Example value in cell B1 =A1, B2=A3 and C1=A2, C2=A4. When you copy and paste this formula down or drag it down, it should work. Is there a way to create an Excel table with a dynamic (formula-based) # of rows? For example, I'd like to build an amortization table, and I'd like to be able enter the # of months in a cell (e.g. 360 for a 30-year mortgage, 180 for 15-year mortgage, 60 for a 12-month car loan, etc) and then have a table with my amortization calculations populate based on the # of rows that I'm interested in.